A living legend of the open-form kind of jazz he plays since the Sixties, Joe McPhee is one of the most requested players of several musical fronts besides jazz, from Pauline Oliveros’ “deep listening” approach to new music to the free rock coalition formed by The Thing and Cato Salsa Experience (he played the music of Led Zeppelin with them), going through a collaboration with the noise makers of Nihilist Spasm Band. 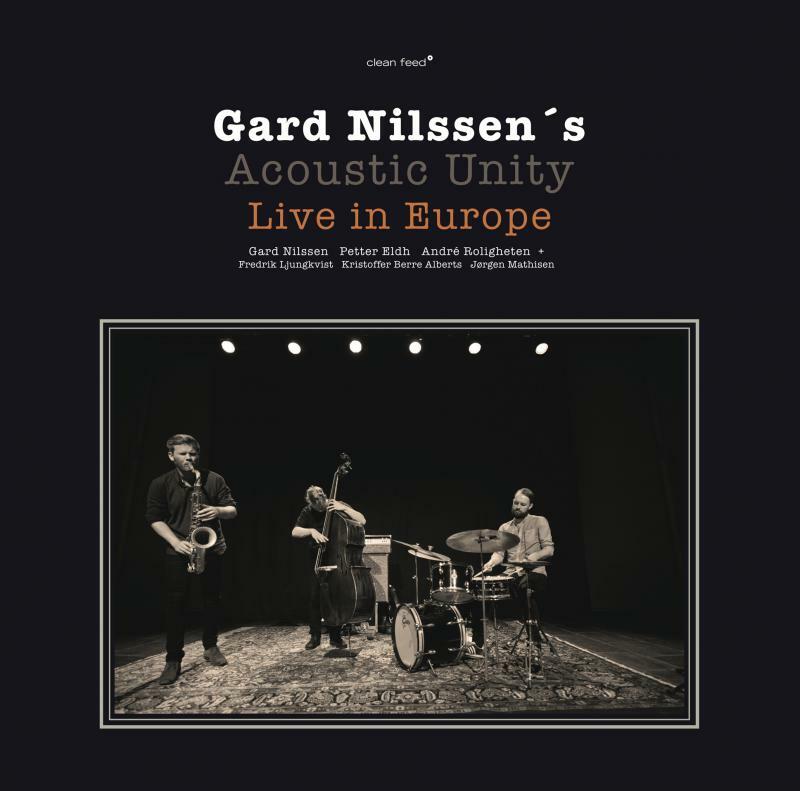 In recent years, he’s being invited frequently to work with European musicians of the improvised music field, and this trio is one of those cases: we find him with the German-French double bassist Pascal Niggenkemper (mostly associated with people like Harris Eisenstadt, Frantz Loriot and Joachim Badenhorst) and the Norwegian drummer who initiated this trio Ståle Solberg, usual companion of the likes of John Russell, Steve Beresford and John Edwards. 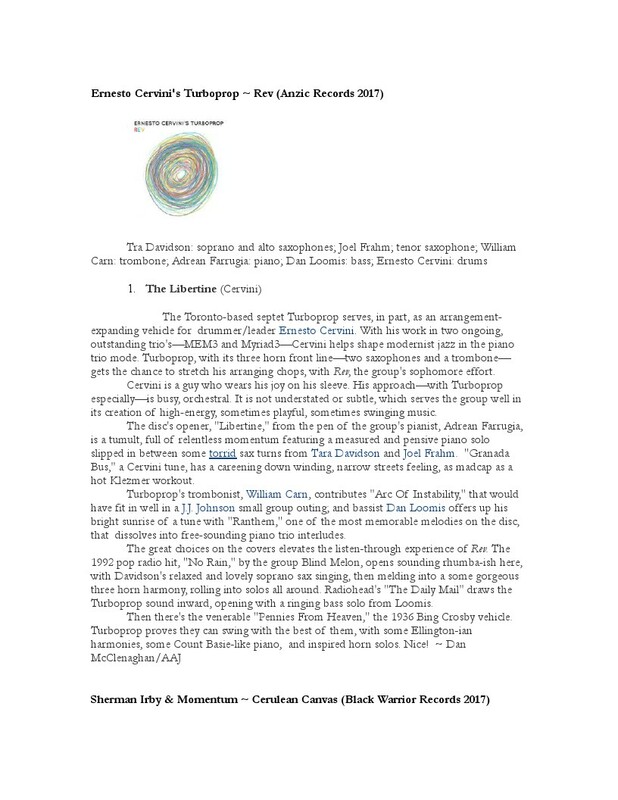 And free improvisation is what you have in “Imaginary Numbers”, even though the one with its inner essence derived from the tradition of free jazz – in this case, searching for a stronger connection with the source, as the piece “A Supreme Love”, dedicated to John Coltrane, testifies. 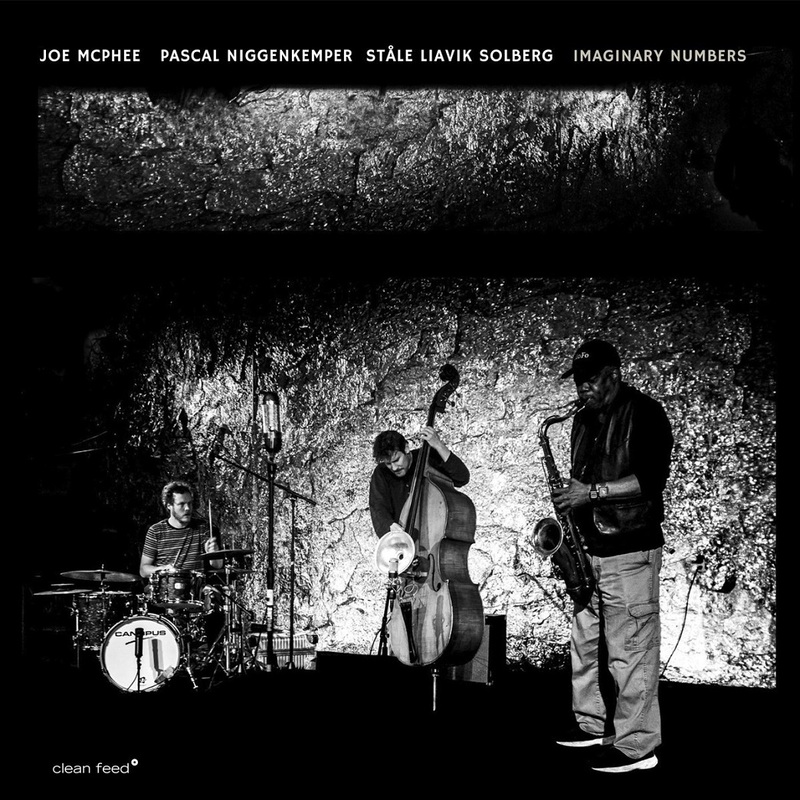 Indeed, the music here seems a coming back to its original home, with the improvisatory ideas of the rhythm section making peace with all the American cultural bag we listen in the way McPhee uses the pocket trumpet and the tenor saxophone. But this isn’t the peace of the swamps: there’s tension all along the narratives, showing that a group improvisation isn’t the search of a lowest common denominator. There’s no bad record with Joe McPhee on it, but this one may be one of his best. 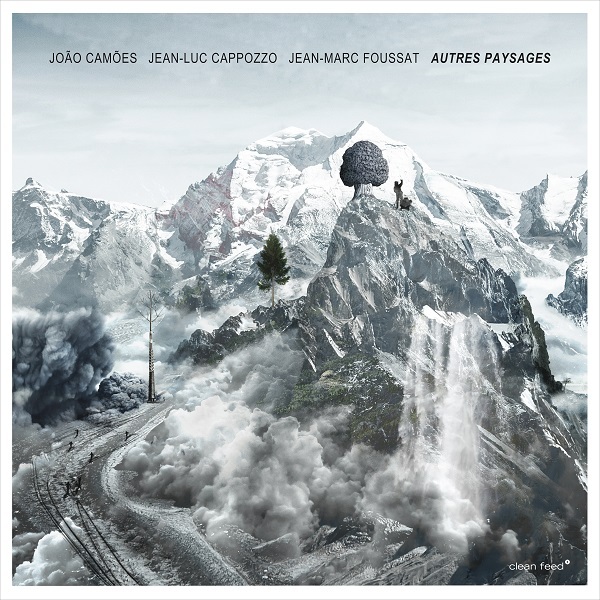 The years spent in Paris by Portuguese violist João Camões prove to be fruitful once again with this new CD, his third with French synthesist Jean-Marc Foussat (the first one was a trio with Claude Parle and the second one a duo). This time, their creative partnership involves one of the most amazing trumpeters active today, Jean-Luc Cappozzo, and it goes to its highest pick ever. “Autres Paysages” is an intriguing opus of electro-acoustic improvisation, combining aspects of contemporary classical and experimental music with all the weight of the history of jazz, very well known by Cappozzo – the only French trumpet player, that we know of, to be invited by Dizzy Gillespie to play with him in concert. 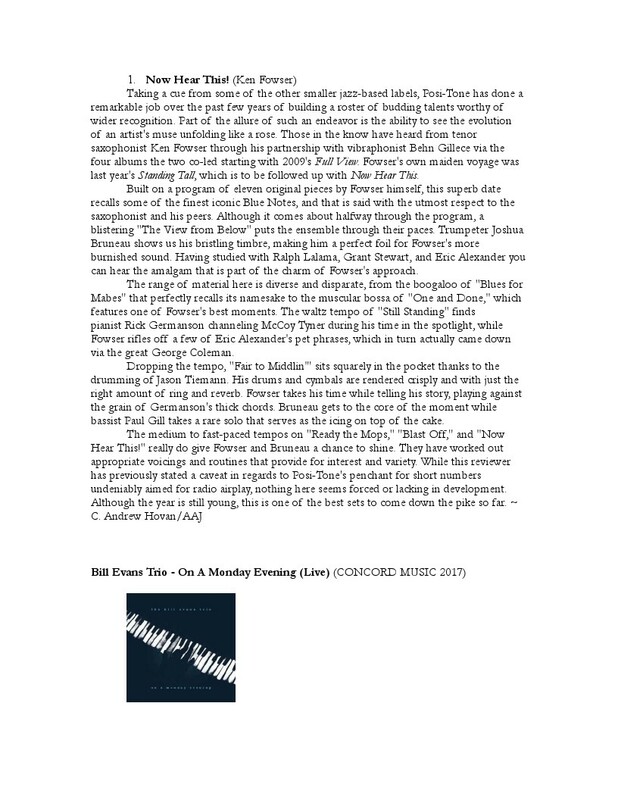 The music is collective in its essence, and sometimes it’s difficult to identify who is playing what in the formed clouds of timbre and pitch or, as we read in the liner notes of the record, «who hides behind the universality of sound». Preparations and extended techniques are used in the playing of the acoustic instruments, changing their respective tones and confusing them with the sounds coming from the electronic devices. But it’s not always like that, and both the viola and the trumpet find space to marvel us with its chamber and jazzy qualities, supported by the pulses of a Synthi AKS. Few times abstract music was this moody, putting you in a dreamlike state, surrendered to the beauty of it all. 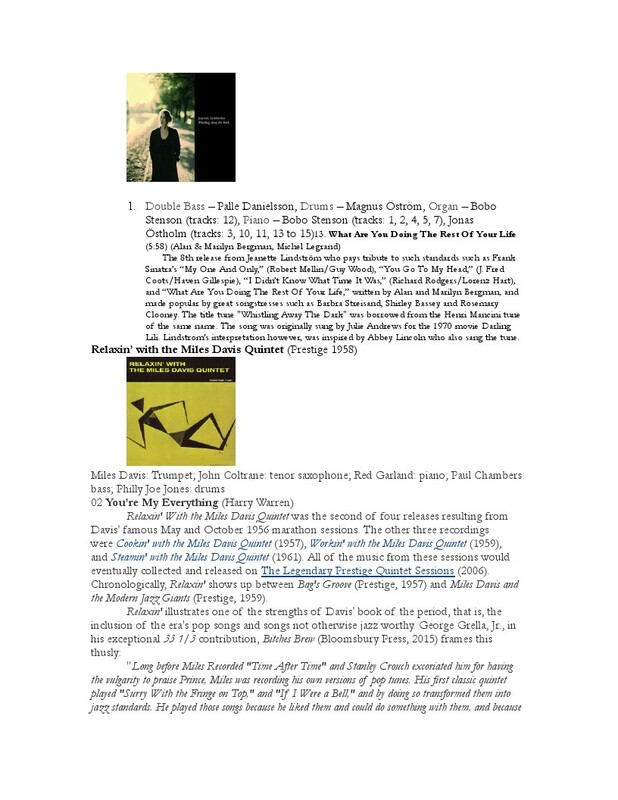 Playlist for Tom Ossana – The Thin Edge – December 13, 2017 MST 7:00 to 9:00p.m. The adjective “quicksilver” refers to someone or something that’s unpredictable, erratic or fickle; mercurial. 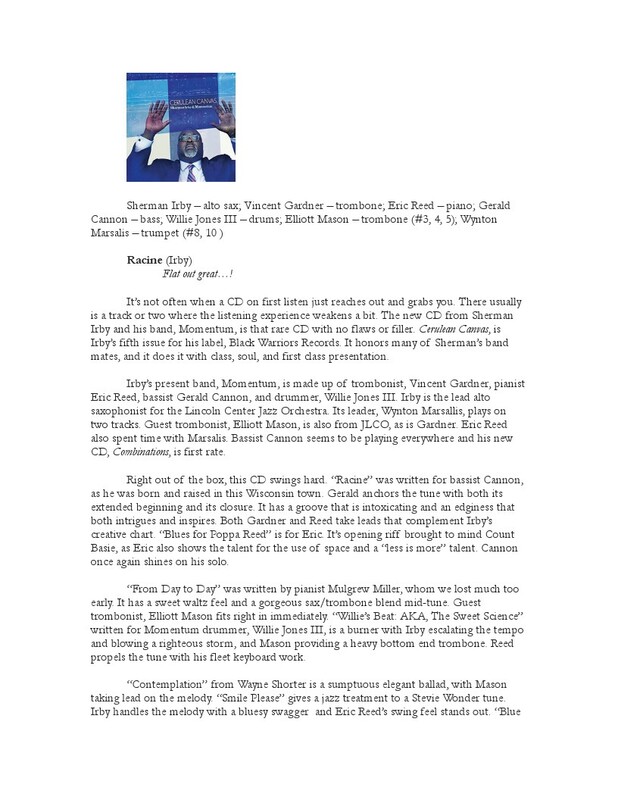 Each of the versions of Horace Silver’s “Quicksilver” is unpredictable. Horace performs the first recorded version of his tune with Curly Russell’s bass and Art Blakey’s drums. This comes from in “Horace Silver Trio” (Blue Note 1952). While snooping for Silver’s version, I ran across the unlikely trumpet combination of West Coaster Conte Condoli with East Coaster Lee Morgan. They had a meeting in 1957 that resulted in their cover on “Double or Nothing” (Fresh Sound 1957/remastered 2003). This cut features Conte and Lee together with Bob Cooper (ts), Frank Rosolino (tb), Red Mitchell (b) and Wynton Kelly (p). Newcomer baritone saxophonist Glenn Kostur concludes our exploration of Silver’s tune with his “The Way of It” (Artist Alliance 2017) featuring Steve Kovalcheck’s guitar. Also new to the show comes Finland’s premiere reedman Eero Koivistoinen in a performance of “Big Five” - named after 5 African game animals and with a time signature of 5/4 – from his “Illusion” (Svart Records 2017). During this cut we’ll get reacquainted with the piano wizardry of Finland’s Alexi Tuomarila. 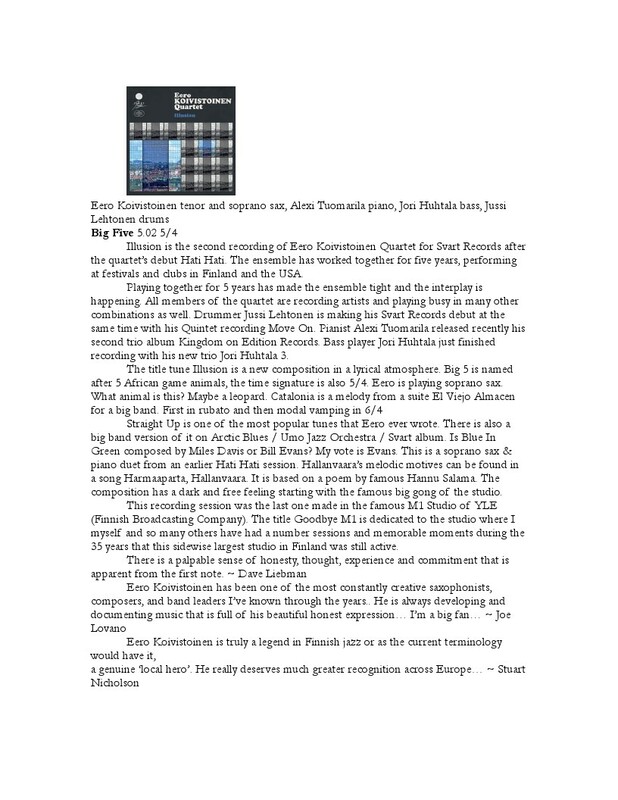 Toronto based drummer Ernesto Cervini's Turboprop ~ “Rev” (Anzic Records 2017) brings this half to a close with his “The Libertine” featuring Joel Frahm and Tra Davidson’s reeds and Adrean Farrugia’s piano. Sherman Irby’s “Momentum” kicks off the second half with a Jazz Messengers’ like cover of Irby’s “Racine” with solos by a Cannonball sounding Irby on alto, Vincent Gardner on trombone and Eric Reed’s piano. 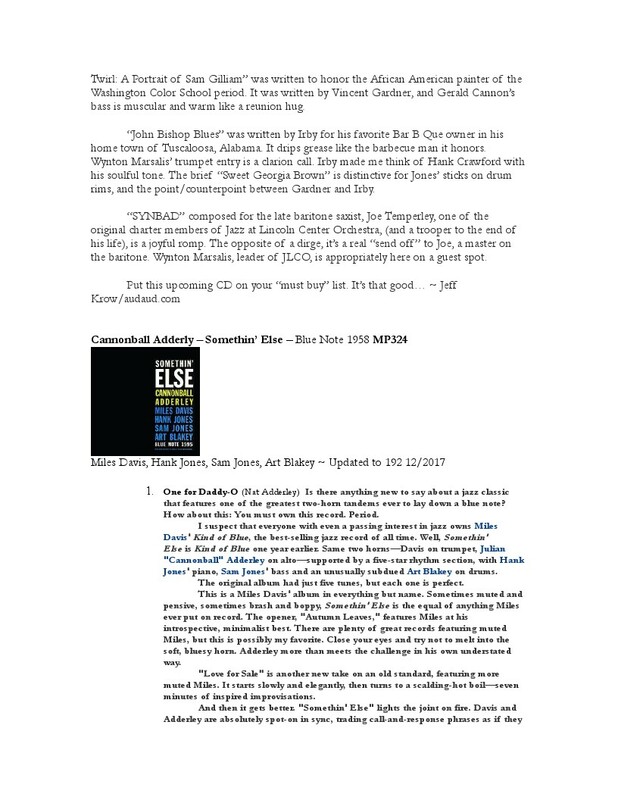 In a Cannonball Adderley recording that rivals Miles’ 1959 “Kind of Blue” – the bestselling jazz album of all time – “Somethin’ Else” (Blue Note 1958) gives us a taste of Nat Adderley’s “One for Daddy-O”. Cannonball’s alto improvises first followed by Miles, the incredible Hank Jones’ piano with a wrap-up from Cannonball and Miles. 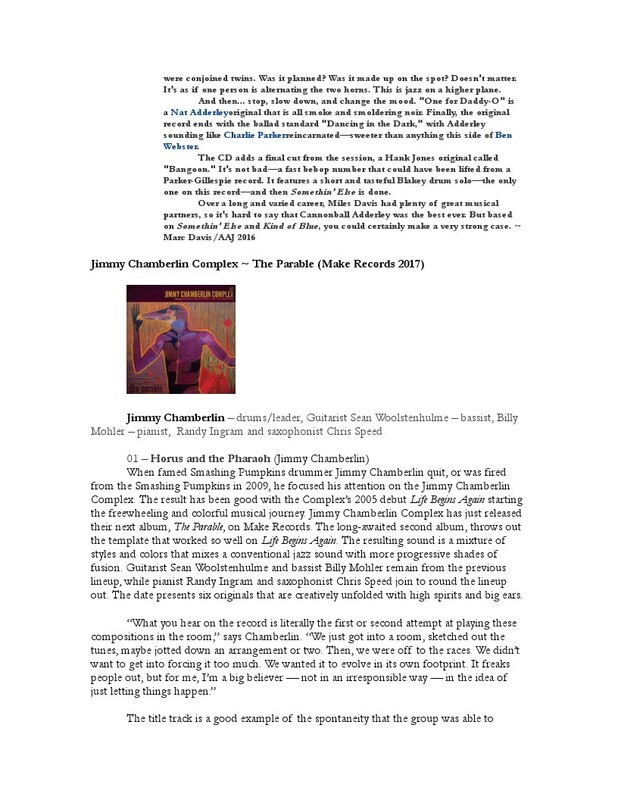 I had doubts seeing the album cover of Jimmy Chamberlin Complex’s “The Parable”, not to mention the first cut title “Horus and the Pharaoh”. “Don’t judge a book by . . .” works here. With Jimmy’s drums pushing the group forward we’ll hear from guitarist Sean Woolstenhulme, saxophonist Chris Speed and pianist Billy Mohler. Woody Herman’s First Herd concludes this half with a cover of Neal Hefti’s “The Good Earth” with Woody’s clarinet and a tenor solo from the wildly popular Flip Phillips who bridged the gap between swing and bop. 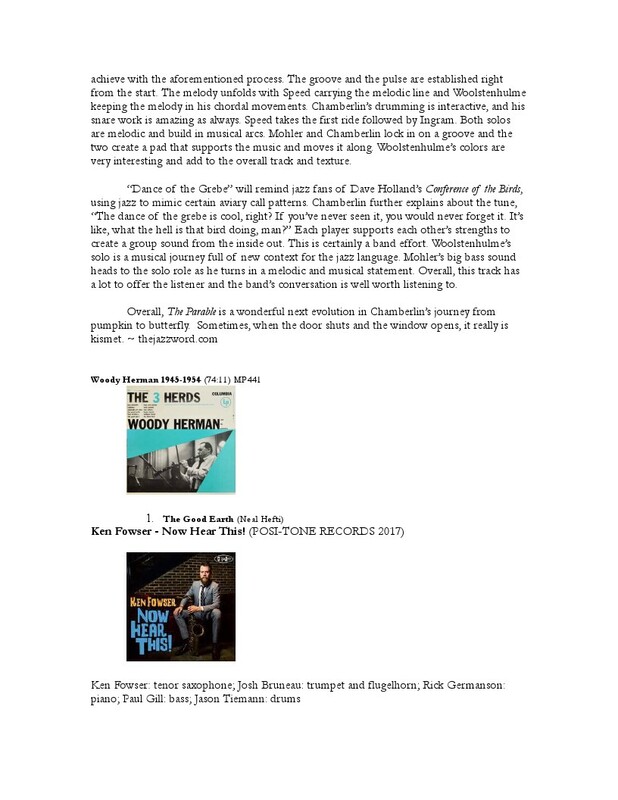 Ken Fowser returns to get the third half underway with the title track from his “Now Hear This!” (Posi-Tone Records 2017) with solos from Ken’s tenor, Josh Bruneau’s trumpet and Rich Germanson’s piano. Concord resurrected a Bill Evans Trio 1976 Madison, Wisconsin recording, naming it “On a Monday Evening (Live)”. 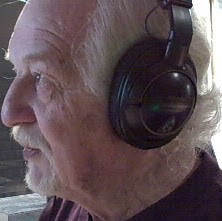 With bassist Eddie Gomez and drummer Eliot Zigmund, we’ll hear a cover of Frank Churchill’s “Someday My Prince Will Come”. 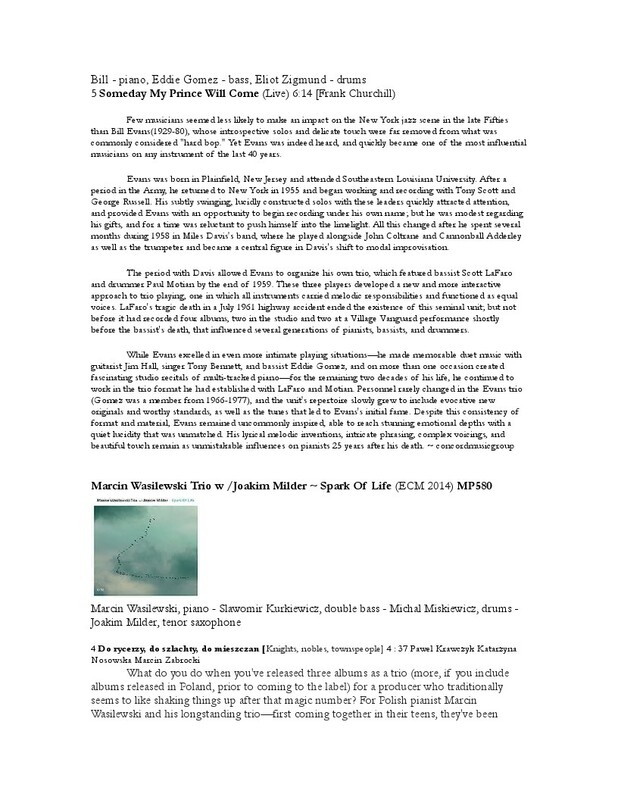 My favorite living pianist, Marcin Wasilewski follows with Pawel Krawczyk Katarzyna Nosowska Marcin Zabrocki’s “Do Rycerzy, Do Szlachty, Do Mieszczan” (Knights, Nobles, Townspeople) featuring the usual trio - Slawomir Kurkiewicz, double bass - Michal Miskiewicz, drums – with Joakim Milder’s tenor from Marcin’s “Spark of Life (ECM 2014). 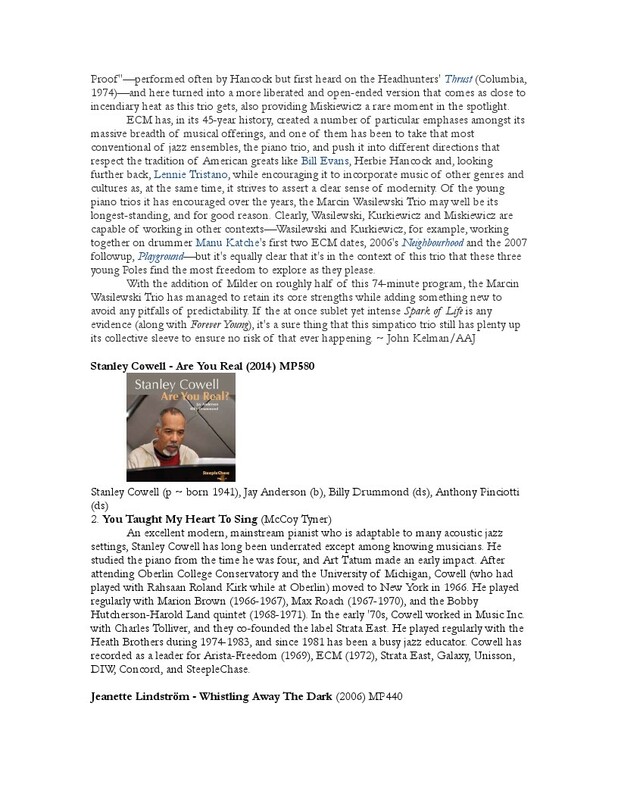 Pianist Stanley Cowell gets us ready for romance with his trio cover of McCoy Tyner’s “You Taught My Heart to Sing” featuring Jay Anderson (b) and Billy Drummond (dr). 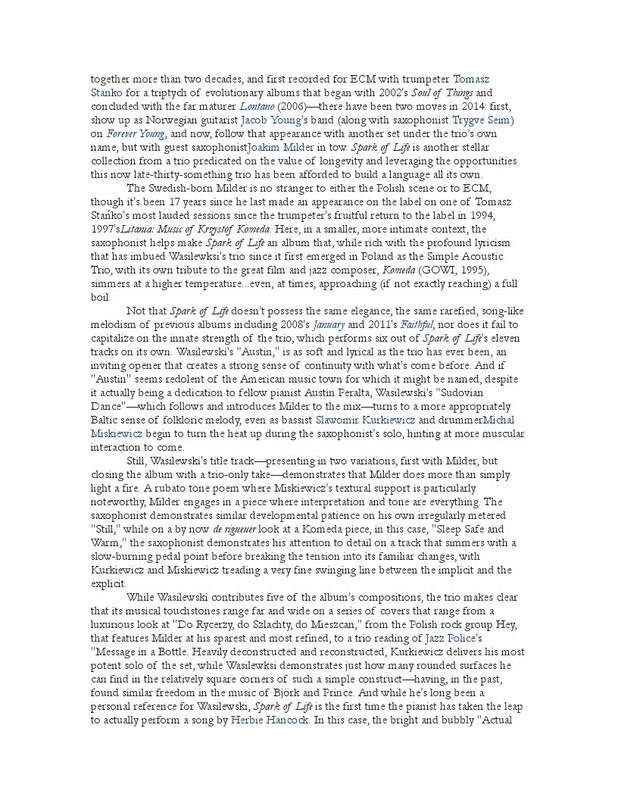 The Romantic Half-Hour begins with Sweden’s songbird, Jeanette Lindström’s eighth release, “Whistling Away the Dark” (2006). We get her cover of Alan & Marilyn Bergman and Michel Legrand’s “What Are You Doing the Rest of Your Life” backed up by Sweden’s premiere pianist, Bobo Stenson. Miles Davis follows with a cover of Harry Warren’s “You’re My Everything” from his “Relaxin’ with the Miles Davis Quintet” (Prestige 1958), his second of four releases resulting from Davis’ famous May and October 1956 marathon sessions. We call the group – Miles, Coltrane, Red Garland, Paul Chambers and Philly Joe Jones – his first great quintet. 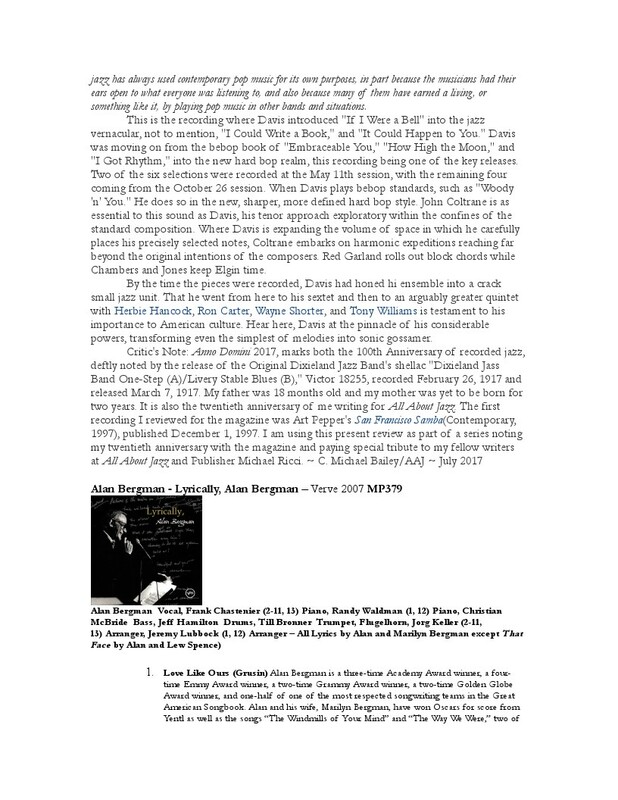 “Love Like Ours”, a tune penned by Dave Grusin with lyrics by Alan & Marilyn Bergman, follows as imagined by Alan’s magical vocal with a large ensemble from “Lyrically, Alan Bergman” (Verve 2007). 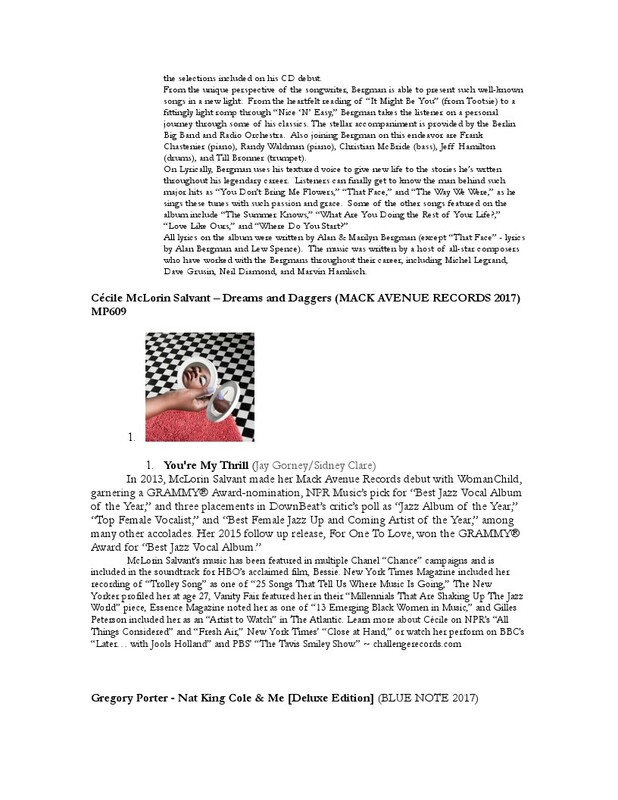 Grammy winner Cécile McLorin Salvant’s “Dreams and Daggers” (MACK AVENUE RECORDS 2017) returns with her treatment of Jay Gorney and Sidney Clare’s “You’re My Thrill”. 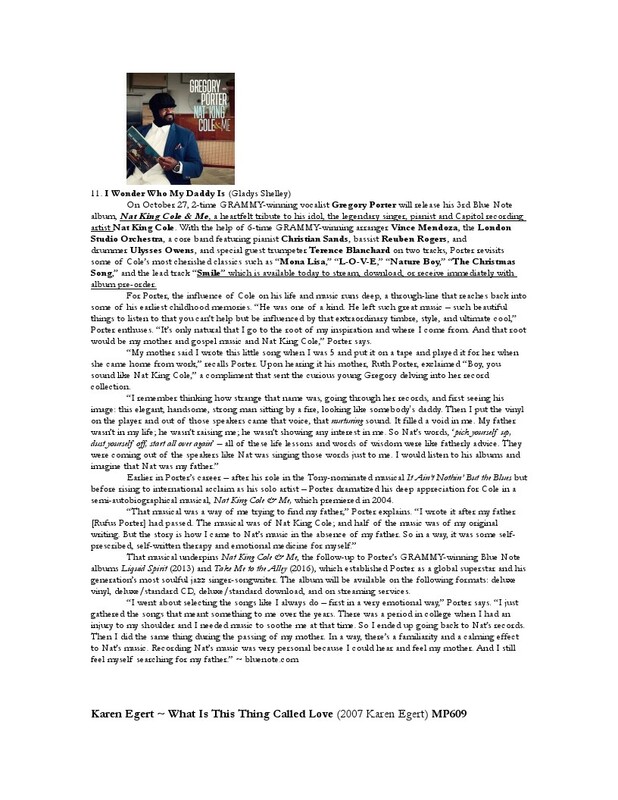 Gregory Porter pays his respects to Nat King Cole with a cover of Gladys Shelley’s “I Wonder Who My Daddy Is” from his “Nat King Cole & Me [Deluxe Edition]” (Blue Note 2017). 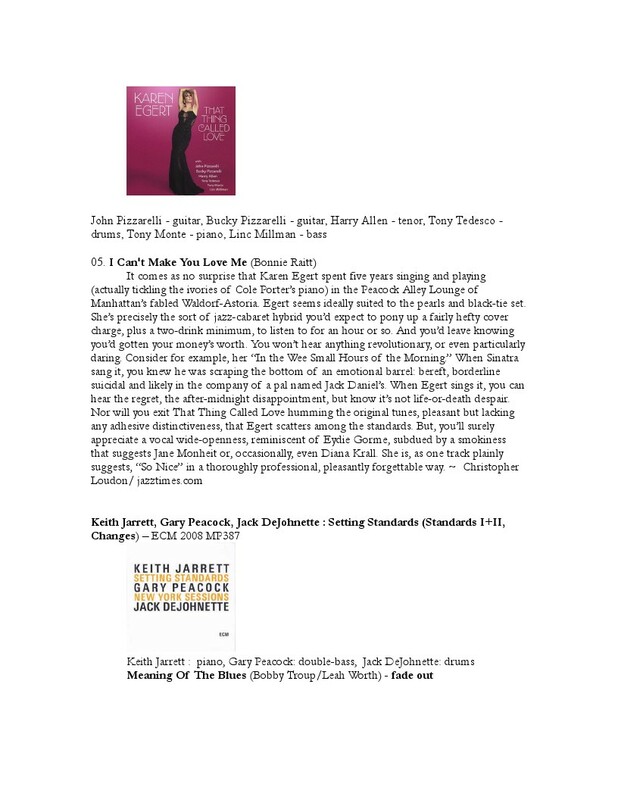 I asked Karen Egert to return to the show with a cover of Bonnie Rait’s “I Can’t Make You Love Me” from her “What Is This Thing Called Love” (2007 Karen Egert). My pleas to the gods of love come to an end. The rest is up to you. wo pianos, four hands; 176 tuned drums, two harps in boxes: but this doesn’t quite cover it. The listener will probably perceive any number of ‘other’ instrumental sonorities evoked at various stages during this music. 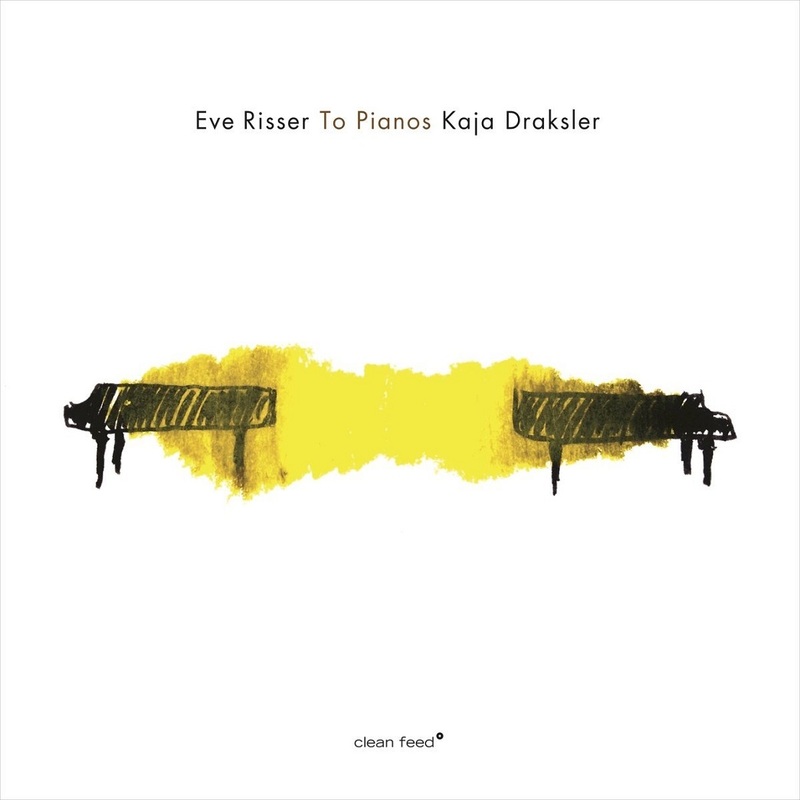 If it’s clear that both pianists have the forensic inclination to mine the details of single sounds, they also possess the Ellingtonian conception of symphonic piano playing. Take, for example, the track To Women, and imagine it orchestrated: the exercise somehow seems to complete itself, entirely because the pianism is so replete with colour and nuance, and so immaculately organised with respect to so many musical parameters. 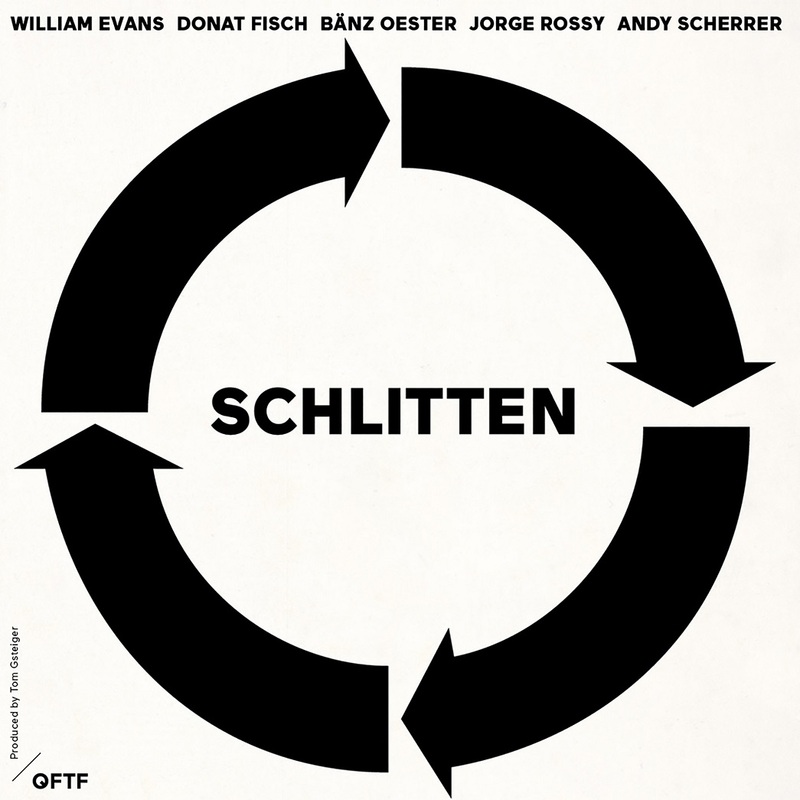 The Schlitten of the title Schlitten refers of course to Don Schlitten, a legendary record producer and label owner, who, among other things, founded Signal Records (with Harold Goldberg and Jules Colomby), recording Duke Jordan and others from 1955 before selling the label to Savoy; then working freelance before founding Cobblestone Records in 1972 with another legendary producer, the late Joe Fields, recording Sonny Stitt and producing the 1972 Newport Jazz Festival, as well as (later) the Muse and Onyx Record labels. 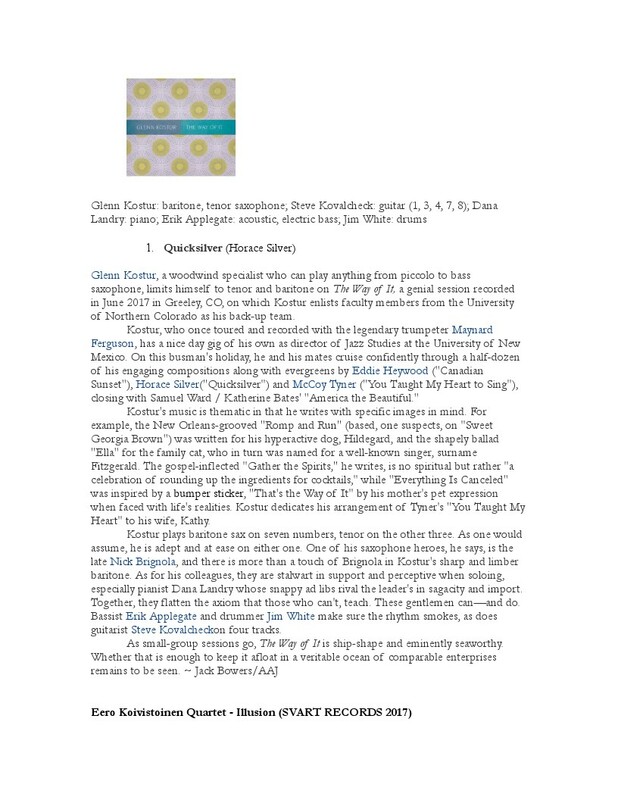 The partnership dissolved and Joe Fields went on to found the highly successful Jazz Depot (HighNote and Savant) while Don Schlitten founded Xanadu Records and recorded Charles McPherson, Ronnie Cuber and other big names in Jazz music. Schlitten has been masterminded by Tom Gsteiger, a Swiss writer with a profound love for Jazz, who also teaches at the Lucerne University of Applied Sciences and at the University for Music, Basel. And while Mr Gsteiger and OFTF the label responsible for this release might seem strange bedfellows, there is nothing strange or whimsical about the music on Schlitten Both the label and the producer seem firm in the belief that a tribute to the kind of Jazz that drove generations of audiences insane from the turn of the 20th century and laid the groundwork for the avant-garde of the 1960s and everything is worth returning to every now and then. 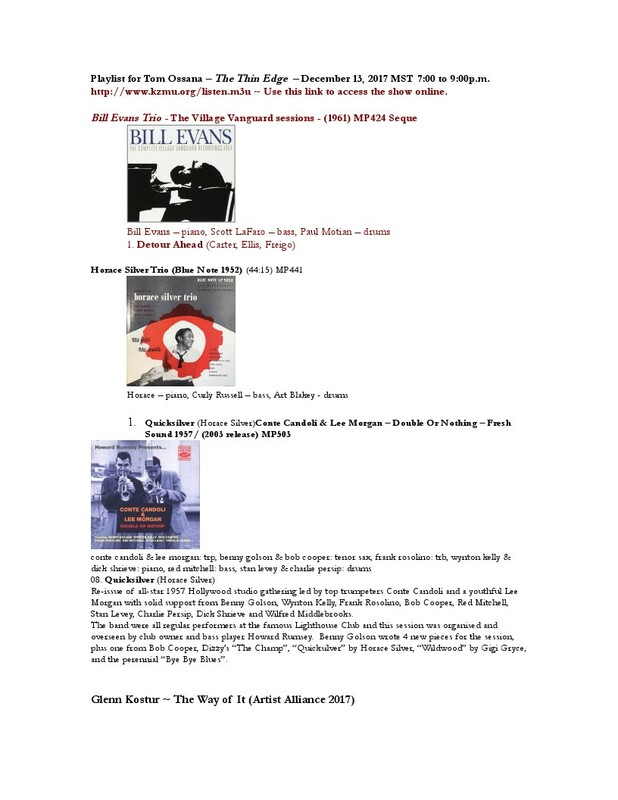 Clearly Mr Gsteiger knew what he wanted to achieve and also didn’t have to look too far to find five musicians to make it swing and then swing some more on eight classic tunes written from 1912 onwards that have entered the canon of Jazz for over a little over one hundred years. And so you would also be hard pressed to find a recording of these works, more true to classic, no-nonsense, straight-shooting melody, harmony and polyrhythms and more thrilling than this one. Throughout William Evans, Donat Fisch, Banz Oester, Jorge Rossy and Andy Scherrer play with usual trademarks of incisive attack and beautifully accented and dramatised Time. This pays rich dividends not only in the warmth of each solo, but in the masterful flights of harmonic fancy when the musicians engage in the kind of ensemble playing that really hasn’t been heard since giants such as Louis Armstrong, Duke Ellington, Fats Waller, Coleman Hawkins, Ben Webster, Charlie Parker and Dizzy Gillespie, Thelonious Monk, Bud Powell, Kenny Clarke and Max Roach, Charles Mingus and a handful of others in the Jazz pantheon walked the earth. 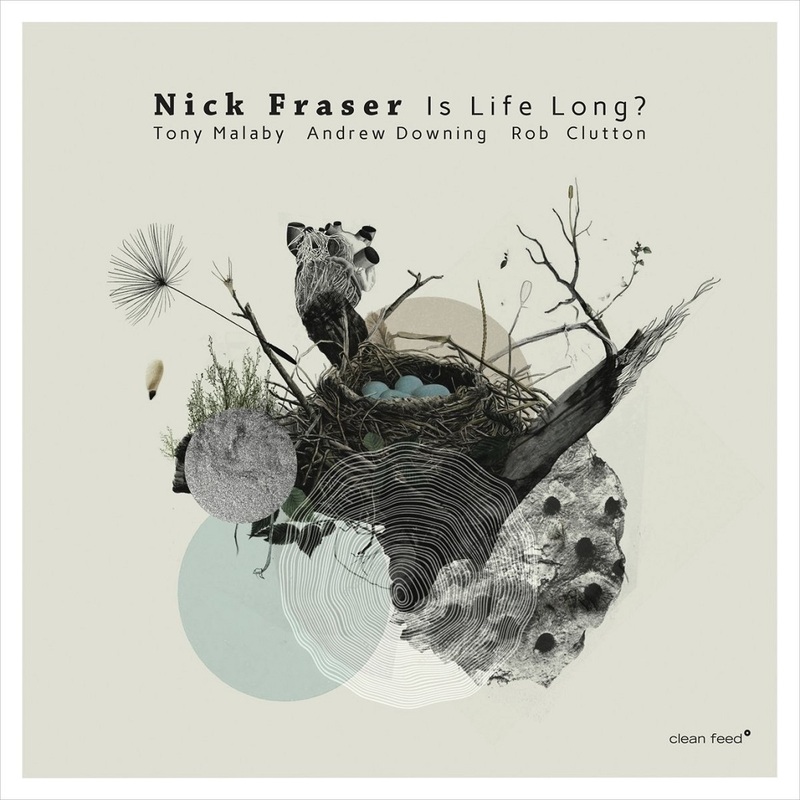 The group of William Evans, Donat Fisch, Banz Oester, Jorge Rossy and Andy Scherrer is particularly alive to the theatre of these quintessentially Jazz works from Fats Waller’s “Jitterbug Waltz” to Thelonious Monk’s “Misterioso” and the magic lingers long after last bars of “Bill” die down. All this in praise of Don Schlitten too.